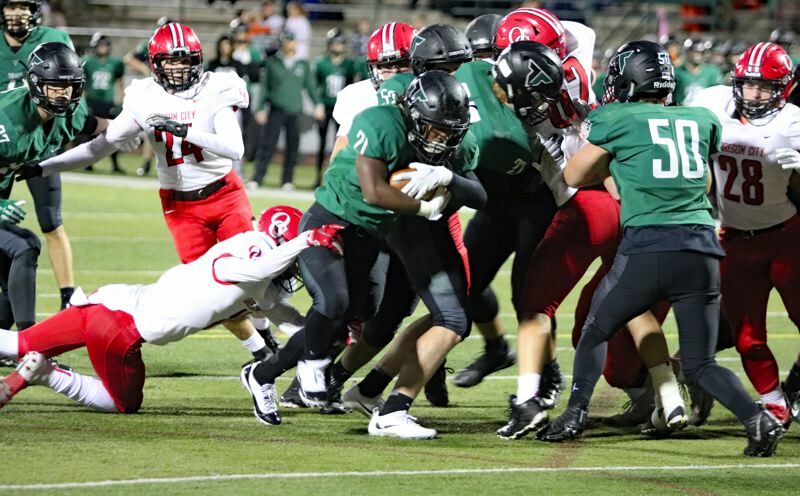 The Tigard Tigers had another one of those nights when almost everything that could go their way on the football field, did go their way Friday night. Tigard quarterback Drew Carter passed for 276 yards and four touchdowns and running back Malcolm Stockdale rushed for 257 yards and three scores, pacing the No. 4-ranked Tigers to a 62-27 home win Friday over the Pioneers at Robert A. Gray Stadium. Fletcher Ahl, Noah Jackman, Max Lenzy, and Luke Ness were each on the receiving end of touchdown passes from Carter, and Spencer Kuffel and Johnny Nomani also found the end zone for the Tigers, who improved to 6-0 overall and 2-0 in the 6A Special District 5 standings. "It was a blast," said Carter, the sophomore quarterback who completed 11 of 15 passes. "We played Tigard football, everyone did their job, and it was a good game. Hats off to Oregon City. They're a tough team." Not as tough as the Tigers, who scored on their first five possessions of the first half, their first three possessions of the second half, and once on defense. The Tigers did not punt once, and they had only two empty drives -- one at the end of the first half when placekicker missed a 39-yard field goal into the wind, the other in the fourth quarter when Stockdale lost a fumble on first-and-goal from the Oregon City 5-yard line. When did the Pioneers know they were in trouble? If Tigard's first three touchdown drives didn't tell them something, then it had to be when Stockdale fumbled on first-and-goal from the Oregon City 6-yard line and Nomani, the Tigers' 6-foot-3, 265-pound lineman, came up with the loose ball in the end zone to make it 28-6 with 8:25 to play in the second quarter. "Tigard is a very good football team, extremely well-coached, just like every other team in our league," Oregon City coach Dustin Janz said. "We were in a different conference for four years and played two really tough teams in that conference, not six tough teams like we have now. "We're learning on the fly how to compete at this level and it's hard and it's tough, but we're getting better. I was really proud that we played hard for four quarters and we didn't give up when we could have given up several times." Other Oregon City highlights included Iverson's 56-yard pass to Calvin Green that helped set up the Pioneers' third touchdown, and backup quarterback Jahleel Heath's 13-yard pass to Dennis-Lee on a third-and-11 play near the end of the 13-play, 80-yard scoring drive for the game's final touchdown. "It was a rough one," Iverson said. "It's always nice to have the defense get stops, but I think the offense had three three-and-outs to start the game. Zee started out with a kickoff return for a touchdown, but it's a team game and we've all got to do our jobs. "It's always sad to lose, but we've just got to keep our heads up and trust in God. Things are going to come together. We can't really point fingers or anything. We just have to keep battling and see where things go." 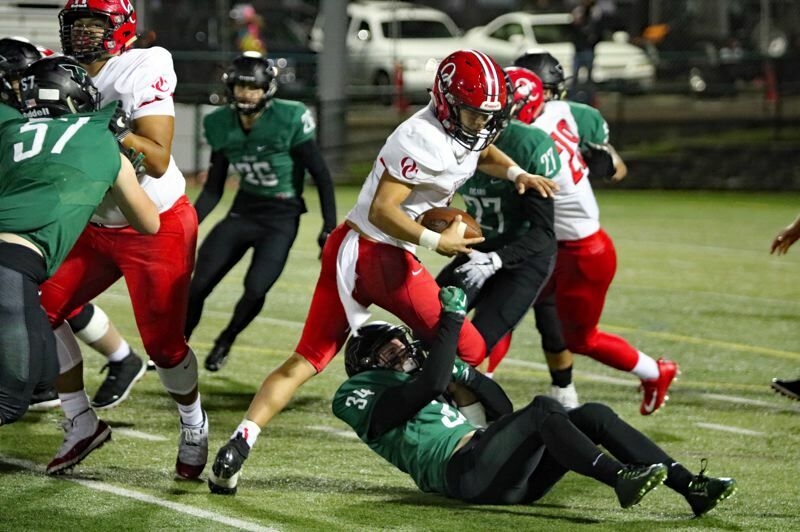 Oregon City's defense was on the field for 61 plays, while the offense ran 50 plays and finished with 268 yards -- less than half of Tigard's total. Iverson completed 7 of 14 passes for 105 yards with one interception, and also had 14 carries for 31 yards, while Dennis-Lee had 13 carries for 103 yards and Hunter Manassero added eight carries for 10 yards. "Tonight, we got beat by a better football team," Janz said. "Offensively, we struggled, but Tigard is a very aggressive defense and you're going to struggle. Defensively, we've got a lot of young guys on the back end and a lot of new guys that have never played varsity before. "They're giving us everything they've got and we're coaching them up on the fly, but we need some consistency and some continuity. I'm very proud of the effort, just not very proud of the outcome." The loss was another blow to Oregon City's playoff hopes, and although it wasn't devastating -- the Pioneers held steady at No. 13 in the OSAA 6A power rankings -- the margin for error is slim with three games remaining against South Salem, Canby, and West Linn. "If we win some football games down the stretch, I think we've got an opportunity," Janz said. "Our league is going to send five teams to the playoffs for sure, and maybe six teams. I really believe that, but we've got to go out and make sure we take care of business next week against South Salem." The Pioneers play host to South Salem (2-4) in a non-conference game at Pioneer Memorial Stadium, while Tigard is scheduled to play its final regular-season home game against Lakeridge (4-2, 2-1). Both games start at 7 p.m.